I had been opposed to the war and naturally suspicious of the military. Yet I had volunteered for three months to help get Iraq back on its feet — and within weeks of the fall of Saddam I had found myself governing a province. By the time I left Iraq many years later, I had served as the political adviser to American generals through the surge and the drawdown of US troops. A British woman, advising the top leadership of the US military … I suppose it must have seemed an unlikely story. Without proper briefing or a job description, Sky left the UK for Basra in June 2003. She had been seconded to the UK’s Foreign Office, but in the chaos she soon found herself answering to Ambassador Paul Bremer, the American heading up the Coalition Provisional Authority (CPA), and acting as “Governorate Coordinator of Kirkuk”. Through a combination of expertise, tenacity, and courage, she became a trusted colleague of Colonel Mayville, the ranking American soldier in Kirkuk, with whom she shared an office. To Mayville, she offered background on the conflict as well as a perspective more sensitive than the military’s to local history and the ethno-religious sensitivities of the groups jostling for influence in the power vacuum left behind by the routed Saddam. She would return to Iraq in 2007 at the behest of General Ray Odierno, and again in 2008 when called by General David Petraeus. The same year, she was made an Officer of the Order of the British Empire for her services to UK-Iraq relations and UK-US relations. 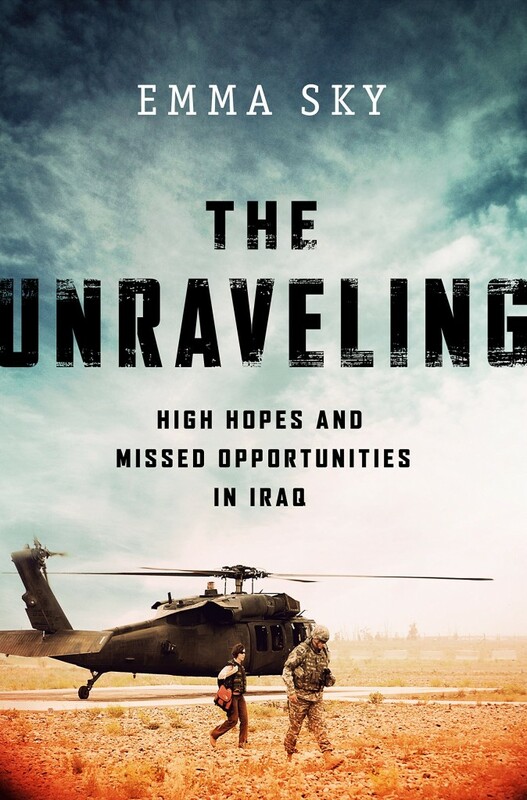 The Unraveling is a terribly apt title. Countless interlocked challenges faced the Coalition in mid 2003, many unanticipated before the start of the war. As the conflict played out over the next decade and beyond, they metastasized and mutated. Perhaps sectarian conflict was inevitable; certainly, opportunities to mitigate it were missed or bungled along the way. Either way, while much of what might have gone wrong did go wrong, it also seems fair to say — on reading Sky’s account — that there are many ways in which things could have been much worse. Sky’s criticisms are far-reaching, sometimes scathing. Iraq, she feels, was too often treated as a pawn in a domestic political game. Donald Rumsfeld, when he visited, seemed to have so little idea of the real-world consequences of the war that he didn’t know where on the map Iran lay in relation to Iraq. Under Obama, ending the war came to be more important than managing the crisis. Hillary Clinton comes under fire for the ambassadorial appointment of Chris Hill, a man apparently more concerned with importing a lacrosse lawn for his personal use than the stability of Iraq. Sky also takes Joe Biden to task for his handling of the 2010 elections in Iraq, during which the US ended up supporting the continued premiership of Nuri al-Maliki against the apparent democratic will of the Iraqi people. But The Unraveling is also strangely heartening. Sky opposed the invasion of Iraq in 2003 and approached the military with suspicion, yet wound up with great respect for their competence, intelligence, and moral fortitude. As often as not, simple diplomacy — face-to-face, nonviolent negotiation — was the best path to success, and the trusting relationships she helped build with Iraqi politicians and civilians alongside Mayville, Odierno and Petraeus proved invaluable. One of the most effective units Sky writes about, led by Lieutenant Colonel Patrick Frank, was embedded in the population of the city of Jihad; their careful, nuanced approach, developed over the course of several months, helped defuse significant tensions in the area. Subtlety and sensitivity aren’t all pervasive — at one point, when video footage of an insurgent blowing himself up is met by the troops with cheers and applause, Sky finds herself aghast at their lack of compassion. “I feel I am in an American jihadi camp, surrounded by violent extremists,” she says to them. But her anger was effective: thanks to the esteem in which she was held by Odierno, no further footage was released to the media following her outburst, a clear example of how the different perspective Sky offered was able to shape the American approach. By the time Sky returned to the UK after her first tour of Iraq, Saddam Hussein was in court. While his capture had been a major victory for the campaign, little had changed on the ground. By 2007, the insurgency had become civil war, and by the time she left for the last time, in 2010, things were in many ways little improved. There are countless lessons to take from The Unraveling about reconstruction and how to conduct an unpopular war in a complex landscape. But for the lay reader, perhaps its greatest value lies in its artful balancing of perspectives and motivations. It seems clear that what good was achieved would not have been possible without the confident righteousness of the US military. Such capability, in turn, was dependent for its direction on the work done by Sky and others to understand the many sides of each situation and to mitigate the harm that might be done in the course of taking action. “I was not a critic on the side,” Sky writes, “but a player in the arena, with all the challenges and compromises that entailed.” We would perhaps all do better to understand what it’s like on the ground before we start declaiming with any certainty. 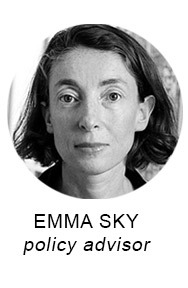 Emma Sky will appear at our next Seriously Entertaining show, Altered States, on September 22, 2015, at City Winery NYC. Buy tickets here.